Biotin for Hair Growth is the Best Vitamin for Hair Growth. However unlike other Hair growth Formulas Help Hair® Shake and Hair Vitamins are uniquely blended. Most Hair loss Vitamins are made and formulated to give you a minimum amount of Biotin for Hair or use a Biotin Supplement that gives use a maximum dose. Some Biotin pills have the equivalent of Biotin 5000 mcg. Some Biotin tablets have the equivalent of Biotin 1000 mcg. But to actually get the maximum effects of Biotin for Hair Growth we need to understand the physiology and biochemistry behind Biotin Hair. What is the real scoop and Biotin reviews from NCBI? Biotin controls blood sugar. Stabilized blood sugar is essential in hair regrowth. "FBS in the biotin group at base was 275±65.76 mg/dl and after 3 months it had reduced to 226± 41.31 (p<0.001). There were statistically significant differences in the mean of total cholesterol, low density lipoprotein cholesterol and triglyceride between the two groups at the end of 3 months (p<0.05)." This can lead to further hair loss. 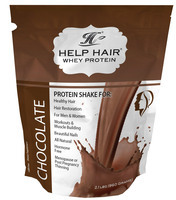 Help Hair® Shake was formulated by a Hair Loss Physician who studied 1,000's of cases of Vitamins for Hair Regrowth. What he observed was that blood sugar is a key component affecting Hair Growth Vitamins. However controlling blood sugar alone will not optimize Hair Growth Supplements without proper dosing and including a blend of Herbs for Hair Growth, Protein for Hair Growth. Too much Biotin for Hair Regrowth can be detrimental and cause Hair Loss and too little Biotin for Hair Growth may have no impact. In fact our recommendation when taking the Help Hair® Shake and Hair Vitamins is to follow our Help Hair Shake Handout. We strongly suggest you follow the guidelines to get maximum results. Please do not take the Help Hair® Shake and Hair Vitamins with other Hair Loss Vitamins. This will impact our Hair Regrowth Supplement by slowing the Hair growth. We strongly recommend visiting one of our Worldwide Help Hair® Clinics to determine the cause of your hair loss problem. Go to ShakeMD.com to check for a local clinic in your area. Listen to what one of our Help Hair Loss Clinics Wordwide has to say about their experiences with Help Hair Shake and Hair Vitamins. Check out what one of our Help Hair Clinics, Erin, Aesthetic Nurse from Dr Jeff Hall's Plastic Surgery and Hair Transplant Center from Austin Texas has to say about Help Hair Shake. Currently Erin treats patients with fillers, chemical peels, lasers. Now she has added to her modalties a non surgical treatment for hair loss by using Help Hair Shake. will impact your hair negatively. Biotin is a water soluble vitamin which impacts your body and how it absorbs. Biotin supplement for Hair is properly dosed and we have seen results in over 1000 patients worldwide.